Strong third-quarter earnings results, and optimistic words from management, helped the stock jump to a more than100% return so far this year. What: Shares of insurance-software company Ebix (NASDAQ:EBIX) jumped 35% higher during the month of November, according to S&P Capital IQ data. 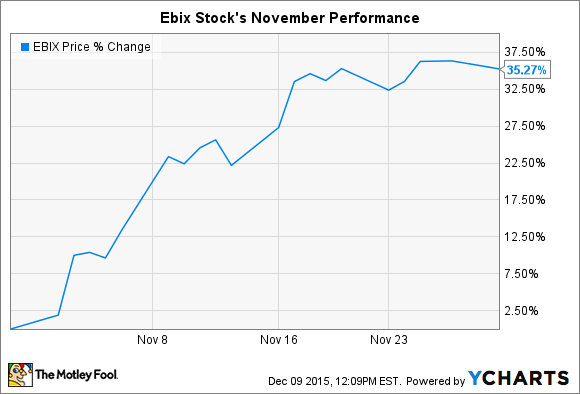 The rally helped shares double so far in 2015: Ebix is up 103% year to date. So what: Investors responded enthusiastically to the third-quarter earnings report Ebix published on Nov. 5. In that announcement, the company revealed that Q3 sales rose 32%, to $66 million, as profit improved by 24%, to $0.59 per share. Those results both beat consensus estimates, which were calling for revenue of $64 million and profit of $0.51 per share. Ebix managed growth across its four main revenue channels, but its risk-compliance solutions continued to do the heavy lifting. That division grew by $12 million, while the company's total revenue gain amounted to $16 million. Profitability is solidly higher, as well. Operating income through the first three quarters of the year is 68% -- up from 62% over the same period in 2014. "We are extremely pleased with the results," CEO Robin Raina said in a press release . Now what: Raina and his executive team believe the best is yet to come, given the enthusiasm that they're seeing from customers signing up for their software-and-services portfolio. "With continued momentum on our side, the deals in hand, a strong pipeline of large contracts at various stages of negotiation, we expect 2016 to be the best year in history for Ebix," he said. Executives pointed to significantly higher spending ahead, both on market expansion and on stock buybacks. Ebix has dedicated $68 million to share repurchases during the last three quarters – up from the $16 million it spent last year. And with $100 million at its disposal, in cash on hand and borrowing capacity, that number could climb significantly. "We believe that purchase of our stock is the most accretive use of our cash, though we intend to balance it with acquisitions also to ensure that we continue to grow Ebix's [market opportunity]," Rain said.